The Which Way? quilt is finished! Finally, after a marathon sewing session involving triaging the new Janome, resurrecting the old Bernina, hand sewing till 1am and then taking advantage of a cold and blustery Sydney summer’s?? day, I finally have the Which Way? quilt bound and washed. 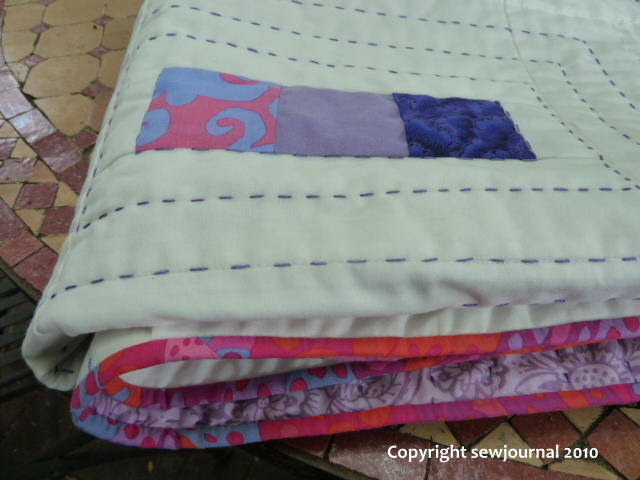 Most of you thought that a purple binding would be best and I agreed until I put the purple next to the quilt and everything just looked flat. Then I tried the Brandon Mably pink fabric that is in the quilt and that was fine but I didn’t have enough left. So I went for another Brandon Mably fabric that I had just enough off and that I felt lifted and energised the quilt. What do you think? Oh Munaiba, I just love it!!! I second that, it’s fabulous – love the design and the handquilting – shame white doesn’t work with 2 rambunctious fox terriers who think they own any bed!! I think you made the right choice!!! That really ended up amazing!!! Munaiba, I love it! I love the clean lines! Looks great to me. Good choice. 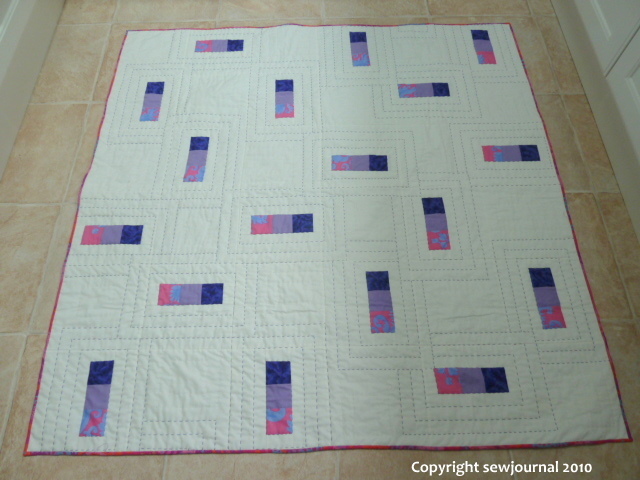 I have never seen a quilt done this way … but then this is my first to this site. Maybe there are others. I like this!! Wow – having the pink binding really helps the other fabrics and colors pop! Great stitching around the blocks too! Thanks for sharing this. You know, I almost said to follow your instinct about it, but thought, “nah, I’ll go with purple.” Well, you know what my answer will be next time…..lol. It looks so lovely! Congratulations!! Love the simplicity! Thanks for a wonderful blog this year, best wishes to all the family. You do lovely work & I am so glad that I found your blog. 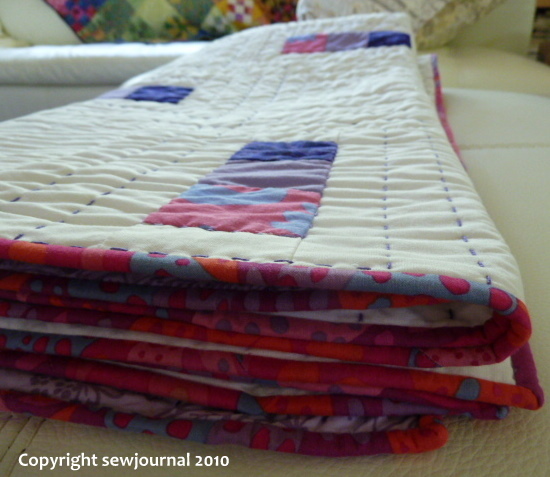 I love your quilt and the fabric you chose for the binding … it goes to show that matchy-matchy isn’t always the most dynamic choice. It is beautiful. 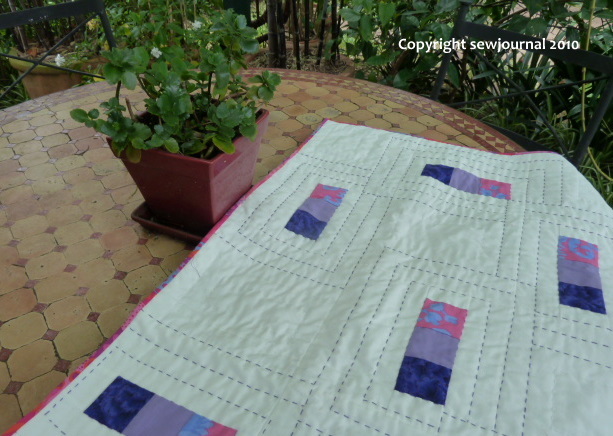 The hand quilting adds a special touch.